the Cloverdale Recreation Centre (6188 – 176th Street – Surrey, BC). A) Sign up a team of 6 riders who fundraise and ride for 10 minutes each on their stationary bikes (like a spin-a-thon), and have lots of fun while joining us in our fundraising efforts. B) Donate an Item, Gift or Gift Certificate from your business for the Prizes given out to the Inside Ride participants – and get your company listed as a “Supporter” on our website for at least one year! C) Donate to The Inside Ride through www.CCFSSurrey.theinsideride.com Donations of 20.00 or more receive a tax-deductible receipt. 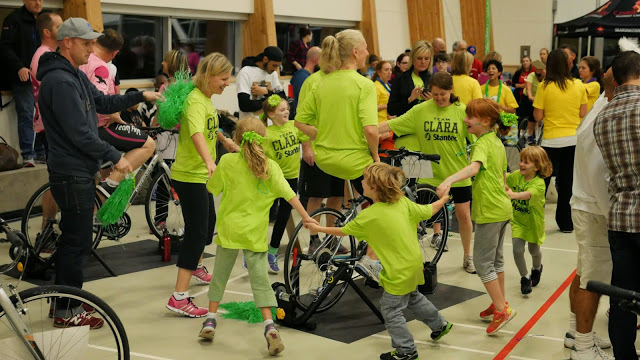 The facility since our 1st annual Inside Ride is none other than the incredible Cloverdale Rec Centre on 176th Street in Surrey. Events coordinator Sue Tomio and the Staff helped to co-host and support our organizations’ fundraising efforts and helped to keep the “fun” running smoothly. Each team raises money through on-line and off-line pledging. After they register, teams & individual team members receive access to their own personal fundraising webpage, along with pledge sheets – this makes the fundraising fast, easy and fun! Medals are presented to the team with the best team spirit, the best team costume, highest mileage team, and the top fundraising team along with the top individual and top volunteer fundraiser. 2017 was our 5th year and a fantastic, fun-filled time was had by all, 25 teams raised over $ 35,000.00! RESERVE YOUR TEAM BIKE TODAY!